Ylang ylang essential oil is a fragrant and sensual oil with a sweet, heavy and exotic aroma. Its relaxing and stimulating properties make the oil famous for its calming effect on the mind and body. It is thought to be an aphrodisiac due to its euphoric effect on the senses. When used in skincare it can help balance oil production. It has also traditionally been used to stimulate hair growth. The oil is extracted from the flowers by water or steam distillation. Amour Natural’s Ylang Ylang is ylang ylang III, meaning it is the oil taken from the third distillation and is an ideal essential oil for perfumery and soaps. Ylang ylang essential oil blends well with sandalwood, grapefruit, bergamot, citronella, lemon, orange, and lavender. 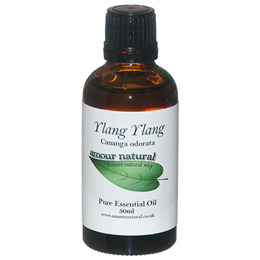 Ylang Ylang Pure Essential oil. Below are reviews of Amour Natural Ylang Ylang Pure Essential Oil - 50ml by bodykind customers. If you have tried this product we'd love to hear what you think so please leave a review. Gorgeous aroma and blends very well with my other favourite oils. I use this every day so will be purchasing again very soon!